I have a love/hate relationship with trade shows. On the love side, I feel like a kid in a candy store, with everything skin-related you can imagine, ranging from the latest in face-lifting microcurrent devices to products so delicious you don’t know whether to slather them on your skin or eat them. What I don’t like so much is that after a while, it feels to me that it becomes row upon row of people trying to convince me that their product or device is the best out there. It gets overwhelming to me, and eventually becomes hard to tell the wheat from the chaff. Obviously, they can’t all be the best, can they? As a skincare professional, I feel committed to do my homework so that I can find the products that I will be able to recommend to my clients with confidence. In the world of chemical peels, I find this especially crucial. After all, a chemical peel is essentially a controlled trauma to a person’s skin. Done correctly, with the best products and the education to know exactly what is needed for the client’s skin type, condition, color and ethnic background (yes, it makes a difference! ), it can render amazing results. But there are also lots of chemical peels out there that can be purchased from less reputable vendors that can damage the skin in any of a number of ways: by drying it out, burning it, and causing permanent pigmentation to it, to name just a few. On the other end of the spectrum, it could be so diluted that it could just do nothing at all. Thats why I absolutely love the PCA peels, peel alternatives, and retail products I use in my treatment room in Planet Beauty in Ladera Ranch. 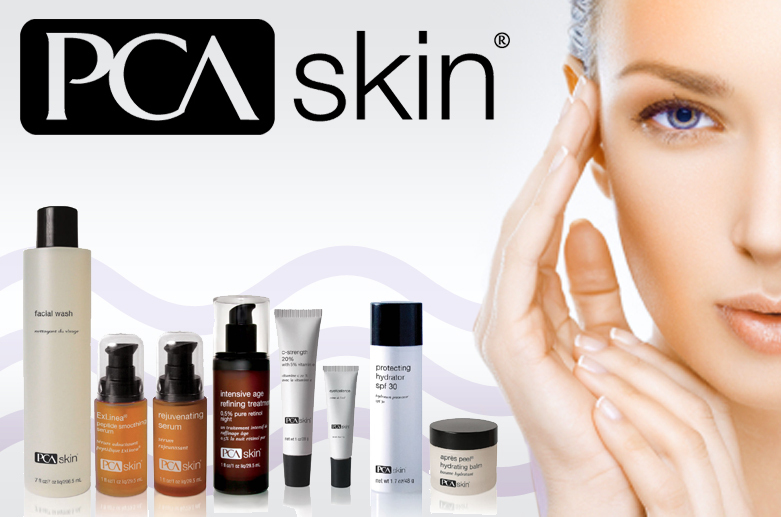 Physicians Care Alliance, or PCA Skin, is used by over 5,000 physicians and skincare professionals in the US, and its products are sold only through licensed professionals. It is sold in over 70 countries worldwide. All its skincare professionals must go through a thorough training process that includes both a theoretical and practical class, as well as a test that must be passed, before they can be certified to purchase, use and sell PCA products. PCA’s products are different, too. Rather than just causing the skin to peel, they keep the skin healthy while doing so. The skin’s health is the main focus, rather than just peeling away the layers. With a PCA peel, the peel is actually a byproduct of the treatment, and the skin may not actually peel at all (although it may), although a change for the better will be happening, one way or the other! Additionally, PCA’s peels are not just one chemical (such as glycolic or salicylic), but peel blends that are formulated to address a multitude of skin types and conditions, and chosen just for you by your professionally trained skin therapist. They are also self-neutralizing, so there is no danger of your skin burning while your therapist watches the clock, and are done in layers, so that if the intensity of the peel begins to get high, the treatment stops. The other huge difference in the PCA chemical peel procedure is the multi-step process. After the cleansing and treatment portions that are pretty much standard procedure in every peel treatment, PCA follows up with correctives at a time when your skin is the most able to absorb them as deeply as possible. The correctives are serums, gels and/or creams selected specifically to address your skin’s concerns, such as pigmentation, acne, hydration, etc. After this step, another layer of treatment may be added in the form of a retinol, followed by a moisturizer, sunscreen, and peptide lip treatment (and a little scalp massage just for good measure, if you’re my client!). Most PCA therapists also send their clients home with a post-procedure kit that contains products for use at home for the first few days post-treatment. Chemical peels, in my opinion, are the most powerful and effective weapons an esthetician has in their arsenal to combat just about any problem, or just to keep the skin healthy, IF the right peel product is used, and the right training is utilized. Not all peels are created equal!